3 Stonesâ„¢ takes just a minute to learn but offers a lifetime of pleasure. Place 3 stones of your color in a row, across, up-and-down, or diagonally, while preventing your opponent from doing so. Just two things to remember... you have to play in the same row or column as the last play, and, you must play whatever you draw, even if it's your opponent's color! The clear stones count for both players. Try to score as many points as you can. Keep score right on the board. 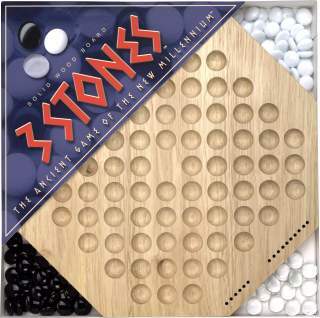 3 Stones is part of Enginuity's Signature Collection of solid wood and glass board games that look good enough to keep on display. The collection also includes Doubles Wild and Soli2. Includes solid wood board, 4 nickel-plated scoring pegs, 80 glass stones, wooden ring. 2 players, ages 8-adult. 2001 Games Magazine "Games 100"
2002 Games Magazine "Games 100"
2000 Dr. Toy "10 Best Games" Dr. Toy "100 Best Toys"
2000 Chicago Tribune "Top 10 Games"